Gain the knowledge and skills necessary to successfully lead an organization as you move into positions with more authority and responsibility. Juniata’s Master of Business Administration (MBA) program is designed for professionals aspiring to do well in leadership roles. Fulltime students can complete the program in one year. Learn more about our MBA program by filling out the inquiry form below. 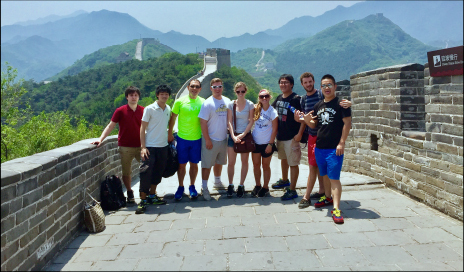 This spring, Juniata's first class of MBA students will be taking a two-week trip to China. There, they will visit leading businesses (like Coca Cola) in major cities, while also taking in cultural sites like the Great Wall, Shanghai's Oriental Pearl Tower, and the Forbidden City. Click on the banners below and learn more about what makes the MBA program unique at Juniata College. Juniata’s business faculty have an extraordinary amount of professional experience. Our faculty have previously served as chief financial and chief marketing officers for international corporations, worked for the largest accounting and management consulting firms in the world (KPMG, PwC, Aon, etc. ), consulted with hundreds of startups, and worked with venture capital firms. This professional experience brings with it access to large professional networks for our students and the practical expertise students need to enhance their own careers. The Juniata College Center for Entrepreneurial Leadership (JCEL), housed in the Bob & Eileen Sill Business Incubator, is an experiential learning program for students that encourages entrepreneurial thought and action. JCEL offers all of the necessary elements to help students develop their ideas for a new product, service, intellectual property, or enterprise and turn them into reality. These newly found business ventures could lead to securing a patent or copyright, starting a business, or forming a non-profit project/organization that addresses a social problem. JCEL is a unique resource of funding, expertise, and space for viable student business ideas. Through our NextStep and seed capital programs, you can use the Bob & Eileen Sill Business Incubator for business planning, research, technology, light manufacturing, conferences, meetings, and other business needs. In addition to learning from faculty who have a broad variety of experiences, students receive insight and mentoring from business leaders through Juniata’s Glaeser Executive-In-Residence program. Executives offer a public presentation; participate in classes; offer advice on interviewing, resume preparation and career progression; work with Juniata’s business professors to hold workshops; and host one-on-one sessions with students. Both executives and students report the individual attention is the highlight of the executive-in-residence experience. The Glaeser Executive-In-Residence program was made possible by an endowment from Carl ‘77 and Nancy ‘76 Glaeser. The program invites business professionals who have achieved uncommon success in the business world to work in residence at the college. Lisa Giles - CEO, Optivara, Inc.
Juniata College has a long tradition of strength in international education. That same strength extends to our graduate programs. The curriculum recognizes the importance of international economic issues and intercultural competence. Many of our faculty have lived and worked outside the U.S. and share their perspectives on international business. MBA students also have opportunities to participate in international study trips, work on consulting projects for international companies, and interact with students who have lived and worked outside of the U.S.
For example, during a recent trip to China, Juniata students met with corporate leaders from Coca-Cola and GM in Shanghai and with Foxconn management in Chengdu. Students also collaborated with students from several of our partner universities and discussed a wide range of issues related to U.S. – China trade. Students also had the opportunity to visit The Great Wall, the Palace Museum, and the Bird Nest Olympic Park among other cultural and historic sites. Please note: Additional fees apply for international trips. A Project Management and Consulting course designed to help student teams address complex business challenges for real clients. Teams will complete a thorough analysis of relevant data and market context before delivering final recommendations for the client to implement. This course mirrors professional situations the students will likely encounter after graduation and serves as the culminating or capstone experience bringing together the business functions and skills learned throughout the program. Teams will utilize Juniata’s Sill Business Incubator and Juniata Center for Entrepreneurial Leadership and have industry mentors assigned to them. Like traditional MBA programs, Juniata’s curriculum focuses on developing technical expertise in the functional areas of business including accounting, finance, marketing, economics, human resource management, and operations. But, we also go a step beyond, inspiring you to be an innovative leader by providing meaningful international study, project management and consulting experience, and executive mentors who will help you on your journey. Formats offered: Online (January 2019) on campus (August 2019). Over time, the MBA will add concentrations in areas to include Business Analytics, Health Care Administration, and others. Prerequisites include an earned bachelor’s degree from an accredited institution and the completion of accounting, microeconomics, statistics, and marketing courses.